One of the best things about making our Aerial upholstery fabric is the excitement of seeing the pieces and projects it ends up being used on. Unlike our blankets, which are a finished product, the story is only half-way through when the roll of fabric leaves our studio. At this stage we hand over the aesthetic baton to the next designer. There are a growing number of furniture, upholstery and architecture studios that use our fabric regularly and the more familiar they are with it, the better the pieces seem to get. One of our favourite upholstery studios is Be Seated - and Edinburgh based studio run by Peter Holmes. Peter has a great eye and a meticulous hand. The images above are of a beautifully restored sofa/ daybed designed by Peter Hvidt and Orla Molgaard-Nielson, and produced by France and Son. 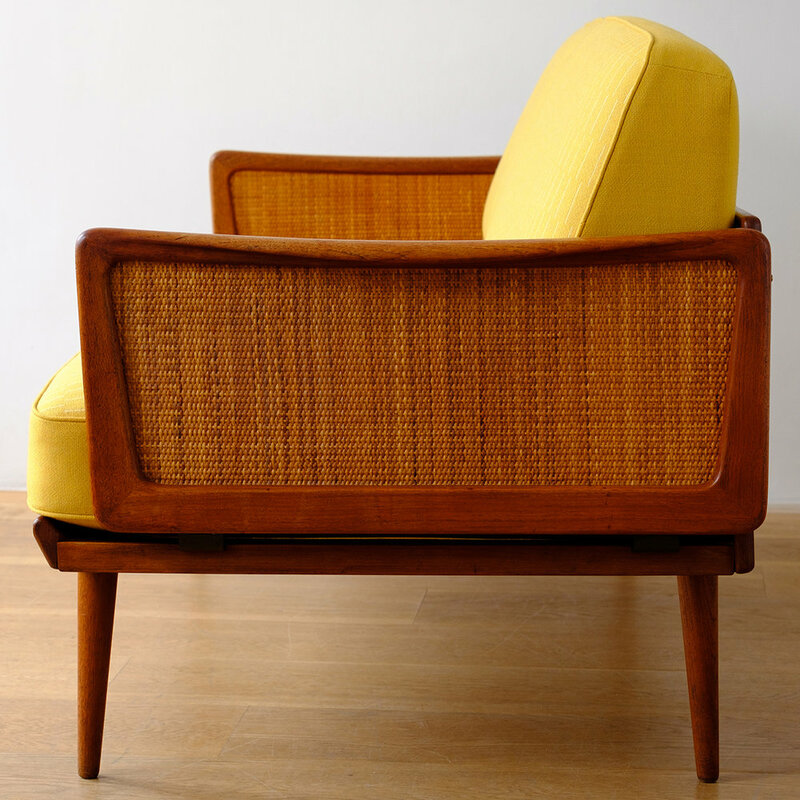 It dates from the late 1950’s and is made in teak and rattan. I love the combination of the warm honey-coloured timber and the rattan, and I really like the way that Peter has set these tones against our yellows. 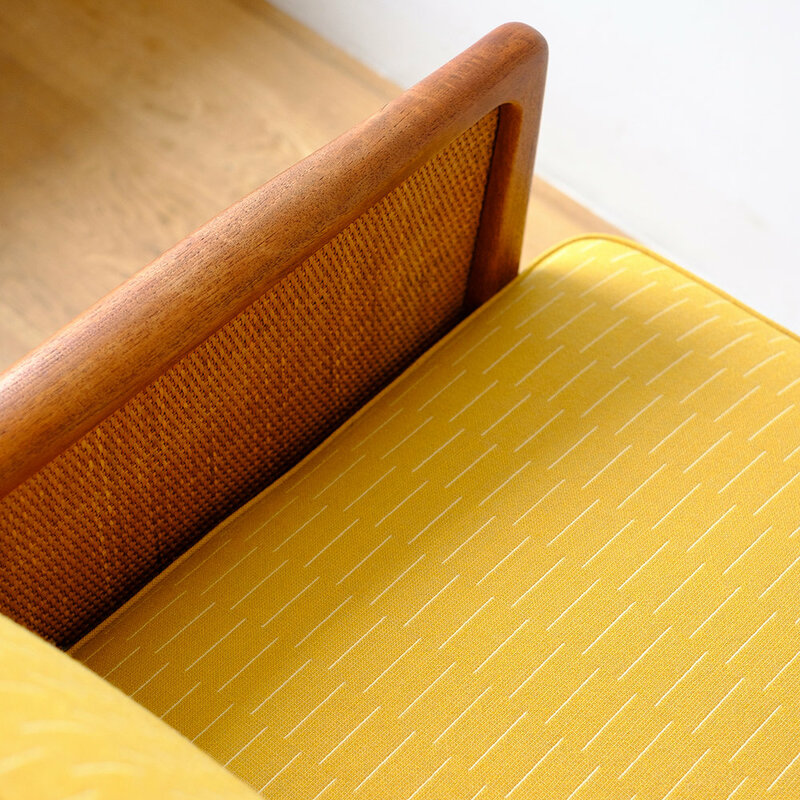 As you can see in the bottom right image above, our Ashkirk fabric has been used for the top of the seat cushion and the face of the back cushions, with our Straw Yellow Ground used for the front panel in the seat cushion and the ends and backs in the back cushions. It’s a thoughtful and clever use of the pattern in the Ashkirk and the complementing unpatterned Straw Yellow Ground. The images above are of a recent collaboration between Be Seated and furniture designer Namon Gaston. The Oxbow lounge chair was launched earlier this year, and is upholstered here in our Petrol Green Ground on a walnut frame. It is a very elegant piece in which the upholstered seat sits in a wooden frame. I was so pleased that they chose our fabric, along with a beautiful textured fabric by Mourne Textiles for the launch.